It's made with very light and durable material--EPP.Flying time: about 20min. Charging time: about 60min. Remote control distance: about 100m With super tough EPP special foam material, the aircraft is flexible and resistant to fall. crashes. The glider is light, and can fly longer than normal indoor RC toys, that's because it takes less energy to support the plane body. No need to know too much about aerobatic theory and you can make a perfect aerobatic flight! 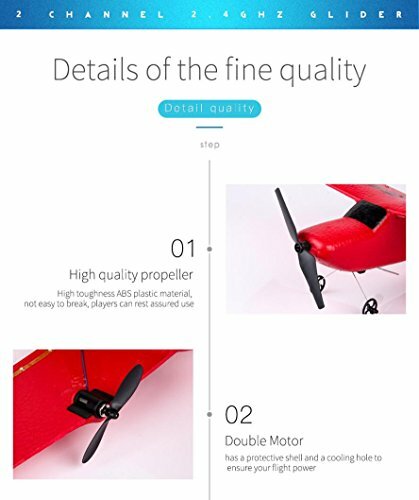 Powerful motors make the model could take off from the ground easily. Easy for a beginner to operate because it is lightweight yet has a sturdy construction.